It’s now known that HRC (as SoS) and her hirelings in FBI leadership planned and enabled the sale of U.S. strategic materials. Immediately after the deal was signed, WJC received $500,000 for a speech in Moscow. Most people in the U.S. bridle when they learn elite factions in Russia and America team up to sell off the homeland’s vital resources. Of course, a close read of the demise of the Soviet Union reveals that Wall St and NATO power brokers sorted through that country's manufacturing and mining sectors, paying pennies on the dollar for companies that later became powerhouses in the new Russia. Its disorganized national and local officials were impotent as vast sums were siphoned out of the country. According to insiders, GHWB was a point man in draining the Soviet Union’s corpse of blood and other valuables. 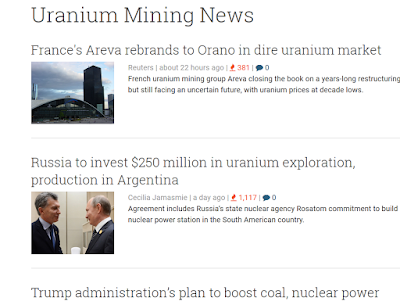 stock here----note in this Hill story (they couldn't ignore it completely, the Hill BTW is 99% "Establishment")....note that they vie away from mentioning Russia as the receiving party for the USA Uranium, and instead they call it "Europe". These types of misdirection expose the narrative and the lies. In this and the next episode of George Webb’s excursion into citizen journalism, there’s a number of items of interest for people who follow all things nuclear. As many of you know, Hillary’s email traffic went silent soon after March 11, 2011. Except for a few messages that passed between HRC and her aides in the early hours of the disaster, Americans remain unaware of crucial details (known to HRC) about severity, health impacts to Americans in Japan, the West coast of North America, and USN assets at risk. As a result of official inattention, scientific focus on impacts to the Pacific Ocean has been diverted. Webb’s research into crimes committed by the FBI has brought to light HRC’s links to uranium mining, processing, transport and sales. Webb’s presentation style is idiosyncratic and thus outside the bounds of legacy journalism. However, his work offers primary researchers in nuclear issues additional traction in slippery times. Your attention is advised.